In the season 1997/1998, Ajax won the Eredivisie title (89 points) with a large difference on the title owner PSV (72 points). Top scorer of the season was the Argentinian Julio Cruz (14 goals), future player of Internazionale Milano. 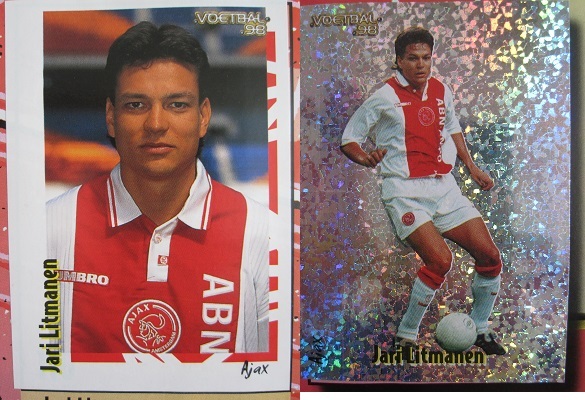 The Panini album Voetbal 98 starts with a foreword and three shining stickers: the PSV title owner, Bosvelt (Feyenoord), and Arveladze (Ajax). Then the 18 clubs are shown following the classification of the previous season, starting thus with PSV Eindhoven. The first six clubs have 28 stickers displaced over six pages: the club badge (shining sticker), the team photo (two stickers), 7 shining stickers of players in action, and 18 portrait stickers. All stickers in this album are large size stickers. The remaining clubs include only 18 stickers: the club badge (shining sticker), the team photo (two stickers), and 15 portrait stickers. Last part of the album includes a special section with the birthday's calendar of Eredivisie players. Here we find also five shining stickers of players in relaxing moments (Dennis and Gerard de Nooijer, Van Bronckhorst, Witschge, Bruggink, Dani). In the last page of the album there is a list with the 300 top-scorers of all time in Eredivisie. Here we find the shining stickers of Nilis and Bosman.